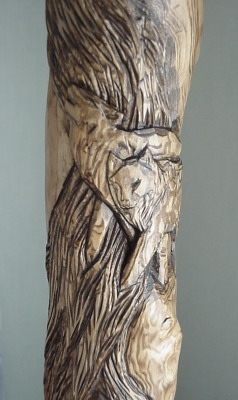 I'm not sure what the client who commissioned this staff calls it, but to me it's "Odin's Beard". This is one of the most enjoyable commissioned projects I've done, and I appreciate the patience this client had since it took two or three months longer than I estimated. 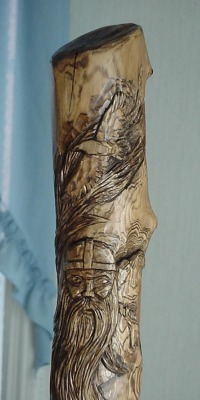 Odin lacks a pupil in one eye since he sacrificed it for knowlege. You realize no archeological dig has ever produced a viking helmet with horns... blame your Wagner operas for the stereotype... 'nuff said on that subject. 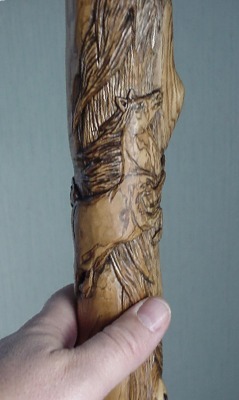 Also on the staff are the creatures associated with him in Viking mythology. They are; the Ravens of knowlege and memory, Hugin and Munin, his wolves Geri and Freki, and my personal challenge, the eight legged horse Sleipner. 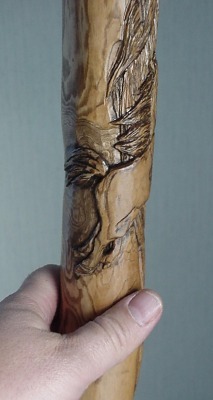 I carved Odin's beard to flow up and over him, and down below him, tying in all the other elements.